Given the aggressive, disjointed, and even sexual nature of his iconic drip paintings such as this one, we can easily surmise that Pollock was one volatile dude. I mean, the guy did die hammered drunk with his groupie mistress by his side when his Oldsmobile became one with a tree. If that isn't volatile, I don’t know what is. Today, a lot of people know Pollock as that dude that somehow got away with literally just throwing paint at a canvas and calling it good. 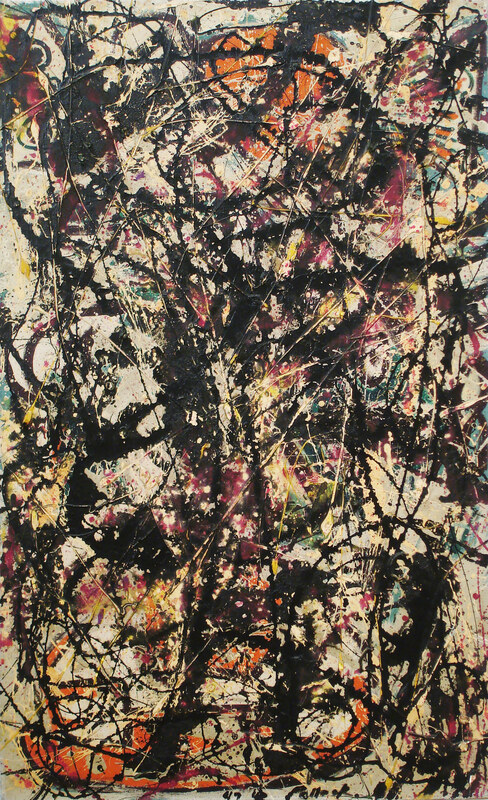 While that may seem like a bit of a simplification (it is), Pollock did not always rep his trademark drip paintings. In fact he used to create representational work, be it uncomfortably violent and stark representations of things, but that makes sense considering Pollock totally nailed the angst filled troubled artist persona. Nonetheless, it was during the 1940s that Pollock really stepped up his art game and began experimenting with paintings such as this one you see before you. Jackson Pollock experienced two doozies as far as life events go in the early '40s. First off, World War II was stacking up to be one of the greatest bummers in human history. For many, life had become filled with an omnipresent sense of doom. Naturally, many people were searching for mental outs, and a group of artists found just the ticket. Originally propagated by the surrealists and then appropriated by the abstract expressionists, the notion of “just do, don’t think” became the ultimate motto in the arts. The fact that people were endorsing action without conscious thought or intention was a notion that Pollock could get down with (possibly because the guy lacked a lot of foresight and was painfully self-destructive), but it is exactly this combo of qualities that people seem to be captivated by when it comes to the world of Pollock. The second life event was getting up close and personal with the work of his ultimate role model: Pablo Picasso. There are a plethora of potential reasons why Pollock felt such a kinship with infamous artist. They were both massive horndogs with a whole slew of affairs to prove it, they both had a real penchant for the sauce, and they were both struggling artists in their youth (Picasso used to burn his paintings to keep warm while Pollock took shelter in chicken coops). Whatever the reason for the attraction, Pollock was highly influenced by Picasso, and when MoMA held a retrospective for Picasso in 1938, Pollock spent long hours soaking in the work of his idol. It was the combination of these events that allowed Pollock to make a splash (pardon my horrendous pun use) in the arts.